A bit of Flash for the weekly writing challenge which gave us the image below to act as muse. 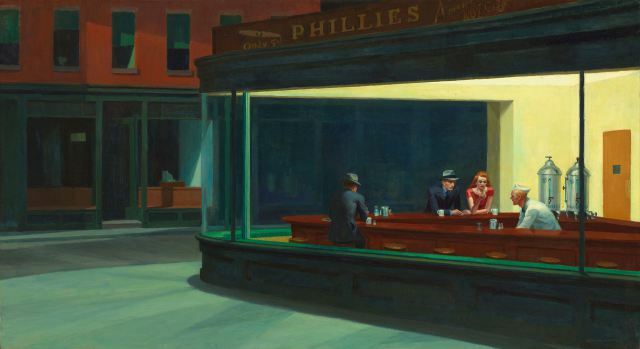 Extra challenge, what else did Edward Hopper paint that is as iconic as Nighthawks? Probably nothing, but he has some absolutely lovely pieces–check out the link…but don’t forget to come back and read as well. Joseph willed himself not to stare. He knew better than to have anything but perfunctory engagement with customers—it had led to more than one embarrassment during his time at Phillies—and if he wasn’t careful, his imprudence would cost him his job someday. Yet, his eyes slid back to the couple at the counter again and again; they were magnets, and his eyes no more than dumb iron forced to succumb to the laws of physics. To keep eyes and thoughts under control, he wiped counters with a vengeance, organized the utensils, and kept the old, solitary guy’s cup full of steaming brew. The woman’s ringing voice cut across the sound of Artie Shaw’s clarinet weeping jazz from the radio standing in the corner. Joseph turned in surprise. He’d been so focused on not gaping at them, he’d neglected their coffees. Mumbling apologies, he tipped the pot and kept his eyes on the stream of black liquid, scrutinizing it as though it might reveal something he hadn’t known before. “He’s cute, isn’t he Frank?” The woman smiled at him, her lurid lips making him think of something from Bram Stoker’s tale. He supposed she wore that shade to go with her dress, but all he could think of was gore when he looked at her mouth. His eyes slid from the blood of the woman’s lipstick, to her companion’s exquisite face. Frank’s slim brows were drawn together, and his curving lips formed a frown as he caught Joseph’s eye. Joseph’s heart hammered, and he knew his cheeks were revealing his discomposure to those deep wells of darkness that seemed to be looking right into his thoughts. But the moment passed in the next blink as Frank turned back to his companion. Her eyes swiveled back to Joseph who still stood frozen, holding the coffee pot between himself and the woman like a shield. They were squinty, those eyes. Too close together. He couldn’t look at her without thinking of a collie with its pinched face on a too-small head. Why would such a handsome man be with a woman like this? She certainly didn’t have good looks, and from what he’d observed, she didn’t have much in the way of personality either. Again he found his gaze pulled back to Frank, to the face that had made his heart skip a beat when he’d walked past the diner windows. If he was with Frank instead of that brash woman, he’d never make him frown. Those arching brows would be raised in laughter, his eyes smiling along with that perfect mouth. But that would never happen. Nothing like that could ever happen for him. Joseph mumbled something unintelligible in response to the woman before turning back to the coffee machine and slipping the pot onto the burner to warm until it transformed into a burnt drink that only slightly resembled coffee. How could he ever find love? How could he laugh, joke, and hold the hands of a sweet-somebody at a soda-fountain? This world would never allow it. If he tried, he’d end up as bloody as that woman’s lips, tossed in a corner of an alley by the men who despised him for no other reason than he didn’t care for women the way they did. You’d think they’d be grateful, those men; one less rooster in the competition for the hens. But for some reason they didn’t follow that logic. Tears pushed at the back of Joseph’s eyes and he stepped into the kitchen for a moment to hide. He nodded silently to the Spanish-speaking dishwasher who glanced up from his grease and soap as Joseph came through the swinging doors. Even Juan had love, though his hands were pruney and his hair smelled like detergent and onions. Joseph had seen the light in Juan’s eyes when his wife came to meet him after his shift—love, pure and simple. Rubbing his hands vigorously across his face, Joseph stepped back out into the cold lights of the dining space, steeling himself for another interaction with the unpleasant Cath and her stunning man. But they were gone. He glanced through the floor-to-ceiling windows, but the street was as empty as the stools where they’d sat. Only the old man at the counter remained, muttering unintelligibly into his now-empty cup. Joseph picked up his rag and began running it over the pristine counters again, the cry of Shaw’s clarinet speaking for him. My heart really went out to poor Joseph and his unrequited love. It was a good story, and I like the fact that it was a less traditional romantic tale. Thanks for your thoughtful comment, Karlee. For years I’ve wondered why I don’t see more diverse characters in movies and TV, (books seem a bit better) and when I write, I like to bring in a wide range of people–to me, that’s what makes the world so rich and interesting, whether it’s a fictional world or a real one. Very Tweetable bit if moody fiction–well done!